Today’s release of data from the 2008 American Community Survey offers demographic data-hounds their first detailed glimpse of the effects that the Great Recession is having on America’s population (no income and poverty numbers yet, however). By far the most reported finding was an apparent drop in the number of immigrants in the United States. This hit the headlines in the Washington Post, the Wall Street Journal, USA Today, and the Chicago Tribune, among others. 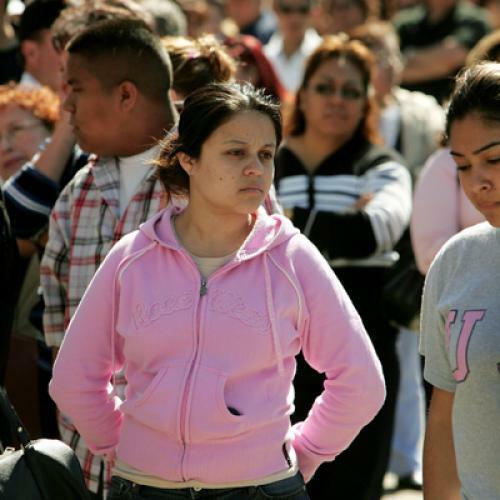 The Los Angeles Times reported a drop in immigrants nationwide and in California. Though the annual ACS is indeed manna for said data-hounds, buried a few paragraphs down in most of those stories (not in the Post’s, notably), however, is the revelation that the reported decline between 2007 and 2008 in the number of immigrants in the United States—about 100,000—“falls within the margin of error.” In fact, the data suggest there’s about a 17% chance that the U.S. foreign-born population was the same in 2008 as in 2007. Typically, statisticians reject as insignificant results that would be attributable to chance at a probability greater than 10 percent (or sometimes 5 percent). This is a continuing issue with the American Community Survey (ACS), which compared to the decennial census long form it replaced, surveys a much smaller share of U.S. households (1 in 38, versus 1 in 6). This means that its results are a less certain portrait of the population than those of the old long form, and thus the Census Bureau reports margins of error alongside all its estimates from the ACS. We reflect the margins of error on our interactive Census data website, but they’re certainly clunky to deal with. Between 2000 and 2006, the U.S. foreign-born population increased by about one million people a year; in 2007, the number dropped in half. That period included a recession, but a much milder one, and one that coincided with a continued boom in housing construction that attracted many immigrants to growing U.S. metropolitan areas. So even a stagnating foreign-born population in a widely acknowledged nation of immigrants is notable. It just doesn’t make a great headline.